Why should I order my transcript through DukeHub? Requests submitted through DukeHub are processed twice every business day, and the status of any DukeHub request can be monitored there under Transcript Request History. Unofficial transcripts can also be ordered through DukeHub and are available for immediate download at any time. Need help submitting your request? Does Duke offer electronic transcripts? Yes, Duke does offer electronic transcripts. Electronic transcripts are available only to students who were enrolled in 2000 or later. Electronic transcripts are delivered via eScrip-Safe. Once your request has been processed, the recipient of your transcript will receive an email from eScrip-Safe (not Duke University) that includes a secure link to access and download the transcript as a PDF. If the inbox notification cannot be found, make sure to check any spam or junk folders. The subject line of the email will say, "Duke University has sent you an official electronic transcript." Does Duke have an unofficial transcript? At this time, unofficial transcripts are available only to current Duke students. This unofficial transcript can be ordered in the Forms & Requests section of DukeHub. For complete instructions, please see this guide. What is the fastest way to receive a hard copy of my transcript? We offer next-business-day delivery (domestic) and 2-3 business day delivery (international) available through FedEx. Requests received after 2:00 p.m. EST are subject to being processed the following business day. Where can I find full course titles and descriptions for the courses on my transcript? Each Duke institution publishes an annual bulletin, which includes a complete course catalog for that academic year. For current publications, click here. For archived bulletins, go to the current bulletin page for the appropriate Duke school and look under Archived Bulletins. What does this symbol on my transcript mean? For a complete key to symbols used on a Duke University transcript, see our transcript guide. The guide also offers grading standards for each Duke institution. How do Duke's semester-course credit units relate to standard semester hours? One semester-course credit unit is equivalent to four semester hours. 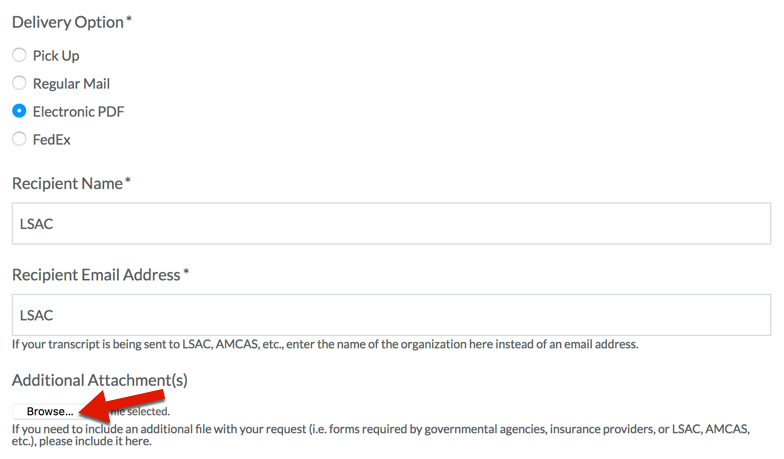 What steps should I take to submit my transcript to LSAC, AMCAS, or a similar organization? If you are sending your Duke transcript to an organization or application service such as LSAC (Law School Admission Council), AMCAS (American Medical College Application Service), or a similar group, you will need to include that organization's transcript form in your request. How can I obtain a copy of my transcript that includes courses taken abroad? Your Duke University transcript will include a record of classes taken while abroad (designated transfer credit), but Duke does not issue transcripts on behalf of any affiliated institutions or organizations. To receive an official transcript of your classes taken while abroad, you must contact the institution or organization that you attended and follow their policy for requesting transcripts. If you need help getting in touch with your institution or organization, contact the Global Education Office. Can I request my transcript/test scores submitted from another school/organization? Duke does not release any documentation submitted from another source as part of your student record. Contact the original source of the transcript/test scores to receive a copy of your record/results. Can I request my transcript from Duke Continuing Studies/TIP/Watts School of Nursing? If you participated in Duke University’s Continuing Studies program, call their office (919-684-6259) to request your transcript. There is a $10 fee per copy. For more information, visit the Continuing Studies website or contact learnmore@duke.edu. Duke University neither issues transcripts for nor retains records of classes taken through Duke TIP, or Watts School of Nursing. For additional help retrieving your record from one of these programs, please contact the organization directly.